Disclaimer: I am not well-versed on the gun debate (meaning it’s not something I’ve researched much) so this may not be a very informative post, but I’d still like to say a few words now about this issue. Over the past six days and in particular, on Friday, I’ve been glued to the TV and internet, getting more and more information about the bombings and suspects. I’ve also been reading the comments section for various internet articles. This is an activity I generally try to avoid because it makes my blood pressure rise and thus, is unhealthy for me and also because the most obnoxious posters are ones that likely fall into the category of people I address in this post. So it’s just not worth it. So why I read the comment sections this past week, especially given my heightened emotional state, is beyond me. There were many posters who wrote genuinely compassionate words and wishes in their comments. Then, there were others who mocked people in Boston for eschewing guns and insinuating that thus, they are “unable to defend themselves.” And then there was this gem, it’s not a comment, but still… really?! So I’m going to call you out on this now. I’m going to spout some political beliefs towards people who wrote such insensitive and ignorant comments. If you had been in my shoes on Monday the only thing I’d be extending to you right now is compassion. But since you weren’t in my shoes then and you have been disrespectful, I have some things to say to you. 1) It is not acceptable to judge people who have just had their city bombed. This is a stressful and horrifying experience and lacking empathy is only going to further damage. 2) It doesn’t look like people in Boston needed their own guns. The people of Boston, Watertown, etc put their trust in law enforcement, who did a phenomenal job and protected them from needing to defend themselves on their own. This is how it should be. Trained officers are the ones there to protect us. The notion of everyone having a gun in their home just in case of some highly unlikely assault does not make me feel more safe. Please hold judgments when people are in crisis. 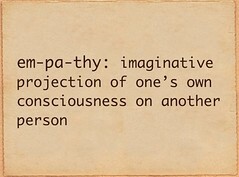 Instead, offer empathy. This entry was posted in Uncategorized and tagged Boston, Boston Marathon 2013, compassion, disclaimers, haterz, ignorance, injustice, trolls. Bookmark the permalink.